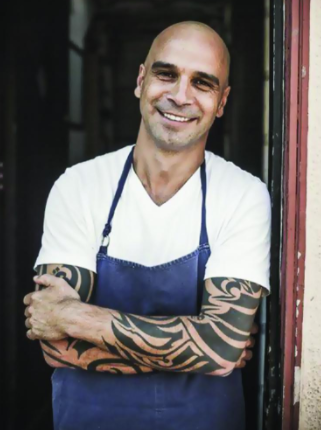 Chef Mourad Lahlou is a Marrakesh native who immigrated to the U.S. to pursue a master’s degree in economics. Missing his country’s cuisine, Lahlou taught himself how to recreate versions of his favorite Moroccan dishes with local ingredients using his own inventive techniques. Most of the lessons he learned about food came from his mother, who cooked traditional Moroccan recipes, and grandfather, who took him to the markets. As the self-taught chef and founder of both Aziza and Mourad, Lahlou has been recognized as one of the most dynamic and creative chefs in the country. Shortly after winning the Food Network’s Iron Chef America in 2009, he released his debut cookbook Mourad: New Moroccan, which Bon Appétit named one of 2011’s best cookbooks. He’s an advocate for national food initiatives and policies, a James Beard Foundation Culinary Ambassador, and was named a member of the American Chef Corps by the Department of State. He is a firm supporter and spokesperson for Chef Tom Colicchio’s Food Policy Action group aimed at reducing food waste in the U.S.